Africason | African School | Africa son | History | Black Consciousness | Education: The Atlantic Slave Trade - A Brief Classroom Explanation. The Atlantic Slave Trade - A Brief Classroom Explanation. As you know from studying American history, slavery remains a crucial area of study in the history of North America. But did you know that this history of slavery is a part of a larger operation that exported people from the African continent to regions throughout North and South America for more than 400 years? Some historians estimate that more than 15 million Africans were forced to leave Africa to cross the Atlantic to be sold into slavery. In addition, millions of other Africans lost their lives during slave raids or during their forced removal to coastal forts where they would be transported to the Americas. As a result of the Atlantic Slave Trade, most people of African descent in North and South America today can account for their families' passage from Africa to the Americas through the Atlantic Slave Trade. The Atlantic Slave Trade took place between the 14th and 19th centuries CE. In this activity, you will be introduced to the history of how the Atlantic Slave Trade began, how it operated, and the impact that it had on the African continent. Pay close attention to the geography of the Atlantic Slave Trade in the text below because you will be asked about it at the end of the activity. You will be introduced to a general history of the Atlantic Slave Trade in this activity, but it is also addressed further in Module Six: Africa and Its Geography, Module Nine: Economics of Africa, and Module Ten: African Politics and Government. The impact of the Atlantic slave trade had on the relationship between Africa and the Americas will also be dealt with in Module Eleven: African Literatures, Module Twelve: African Art, Module Thirteen: African Music and Module 15: Africa and the World. Europeans had been involved in trade with Africa since before the Atlantic Slave Trade began. In Module 7A: Early African History, you learned that there was extensive trade in gold and salt across the Sahara Desert. Europeans had become involved in this trade and developed a strong demand for gold in their economy. However, Europeans were dependent on "middle-men" who would bring gold from the Kingdoms of West Africa across the Sahara Desert. In the 1400s, Prince Henry of Portugal began an initiative to seek out direct sea routes to gain access to the gold trade in West Africa, as well as trade in Asia. In the fifteenth century, European countries were seeking trade routes with Asia, particularly the spice islands of south-east Asia. Just as Spain sponsored Christopher Columbus in his attempt to find a sea route to Asia by sailing to the west, so Prince Henry and the Portuguese hoped to find a sea route to Asia by sailing around the coast of Africa. What began as a quest for trade in gold and spices, ended up becoming a trade network exporting African slaves, which would continue for more than 400 years. The first slaves brought to Portugal came in 1444 from Northern Mauritania. From Mauritania, the Portuguese moved their way down the western coast of Africa, establishing contact all the way down to the Cape of Good Hope and around to the other side of Africa. Through these contacts, the Portuguese initiated trade relations that grew into the Atlantic Slave Trade. Portugal was the first of a number of European nations who became involved in the Atlantic Slave Trade. The Dutch, French, Spanish, and British soon followed in their footsteps. See the map below to find some of the exploration routes that the Portuguese followed. As an example of what transpired through this period of Portuguese exploration, we will briefly look at the Kongo (Congo) Kingdom. Remember that this is one of many examples and does not represent what happened in every instance. The interaction of European powers and Africans varied from region to region. In this example, you will see that what may have seemed like a diplomatic exchange of citizens in the beginning grew into a system of slave trade that devastated the Kongo Kingdom. In 1483, the Portuguese began a long-term relationship with the Kongo Kingdom (see map below to locate the Kongo Kingdom.) Portuguese explorer Diogo C�o sailed via the Atlantic Ocean down into the mouth of the Congo River. Upon reaching the Kongo Kingdom, he took Kongo emissaries back with him to Portugal, who later returned to Africa with European soldiers, priests, and goods. This was the beginning of a strong trade relationship with the Kongo that exported slaves and ivory in exchange for European luxury goods and guns. 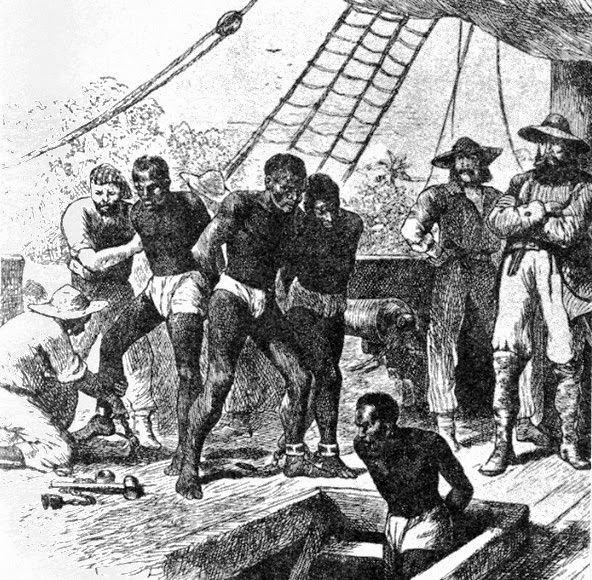 Although historians know that slavery existed in some places on the African continent prior to the Atlantic Slave Trade, the ways in which African slavery compared to and interacted with the exportation of African slaves across the Atlantic remains a topic of much discussion and debate. The nature and extent of slavery in Africa before the Atlantic Slave Trade is difficult to know. Many historians suggest that slavery as practiced in different areas in Africa was not the same as "chattel slavery"-seeing human beings as mere property-, which was practiced in the Americas. For example, slaves in some West African societies filled different positions in society, including positions of important responsibility; they were not restricted to hard labor. It is not easily determined to what extent the Atlantic Slave Trade fueled and even transformed the practice of slavery within Africa. Certainly this varied from region to region, and there are many regions within Africa where slavery was not even practiced. However, there is no doubt that the Atlantic Slave Trade brought dramatic changes on a global scale throughout the African continent as well as the Americas. In the case of the Kongo Kingdom, a form of slavery existed prior to Portuguese contact, which the Portuguese tapped into. However, the Portuguese had a dramatic impact on the Kongo Kingdom through pressure to increase raids of neighboring peoples to capture for the Atlantic Slave Trade and the exportation of large numbers of Kongolese over many years. The Atlantic Slave Trade fueled violence in the region, removed productive workers from the Kongo, and encouraged an economy built around slavery. Over time, the Kongo Kingdom became weaker and more dependent on Portuguese assistance. The Atlantic Slave Trade essentially worked like a triangle between Africa, Europe, and the Americas. If you look at the map of the Atlantic slave trade, you will see how the route worked. Trade goods, such as guns and textiles were sent out of Europe and traded in Africa for slaves. The slaves were crammed into ships that crossed the Atlantic in order to provide labor for large plantations in North and South America, which were growing cotton, sugar cane, and tobacco. These regions of North and South America were European colonies for much of the Atlantic Slave trade and served to provide raw materials to Europe for manufacturing. On the map below, you can see that slaves were sent from Africa not only to North America, but also to the islands of the Caribbean and the east coast of South America. Actually, the smallest number of slaves was exported to North America, as compared to the Caribbean and South America. About � million slaves (out of 15 million total) were sent to the southern part of the United States. Approximately half of the total slaves sent to the Americas went to the Caribbean, and about a third of them went to Brazil. Indeed, as a legacy of the slave trade, Brazil has the largest population of people of African decent outside of Africa. However, the population of slaves in the United States grew at a higher rate than it did in these other regions. Consequently, the African-American population in the United States today is second only to Brazil in the New World. To speak about the degree of human suffering that took place during the Atlantic Slave Trade is not an easy task. Slaves were kept living in abominable conditions in dungeon fortresses along the coast of western Africa until the time that they were sent out to sea on large boats headed for the Americas. Both the slave forts and slave ships kept people in dark, dirty rooms with little to eat or drink and no room to move. They were kept in chains and left to lie on their backs on slave ships while crossing the Atlantic Ocean. This long and treacherous journey has become known as the "Middle Passage." Historians estimate that as many as 20% died while crossing the ocean, not to mention those who died in the slave forts while still in Africa. To learn more about the slave forts, visit the website http://webworld.unesco.org/goree/ that will tell you about the Island of Goree, where many slaves were kept before being shipped off to the Americas. This and many other former slave forts can be visited today in West Africa to learn about the history of the slave trade. A number of factors contributed to ending the Atlantic Slave Trade officially in the early 19th century after it had continued for over 400 years. Among these was a growing public revulsion against the slave trade. One important person in bringing about this change was Olaudah Equiano. Olaudah Equiano was born in present-day Nigeria and taken to the Americas as a slave. During his life, he was able to buy his freedom (a rare occurrence) and wrote about his experience being captured and sold into slavery. His book was published in 1789 and read throughout the Americas and Europe in multiple languages. His writing had a profound effect on public opinion on the slave trade. In addition between 1801 and 1803, there had been a successful slave revolt in the Caribbean island nation of Haiti, which shook people throughout the Americas to realize that this system of slavery could be challenged and overthrown. Under the leadership of Toussaint Louverture, an ex-slave, in 1804, Haiti became the first black republic in the world and the first country in the Western Hemisphere to abolish slavery. To learn more about the history of Haiti link, to http://www.discoverhaiti.com/history.htm. Finally, the Industrial Revolution in Europe and North America, which occurred simultaneously with the Atlantic Slave Trade, was fueling a growing demand for free rather than servile labor. In the early years of the Industrial Revolution, cheap raw materials, such as cotton, produced by slave labor in the Americas were essential, but by the 19th century continued industrial expansion was dependent on a flexible and mobile labor force. Consequently, many European and American industrialists who supported the slave trade in the 18th century changed their minds when slavery was no longer an economic benefit. In 1807, Britain became the first European nation to ban the slave trade. France, Holland, and the United States soon thereafter passed legislation banning the slave trade. However, since Spain and Portugal did not follow this example, African slaves continued to be sent to countries in South America until near the end of the 19th century. In an attempt to stop the slave trade, Britain dispatched war ships to intercept slave ships off the west coast of Africa. When intercepted, the freed slaves were often sent to Liberia ("Liberty") and Sierra Leone (capital city named Freetown) in West Africa, which were established by US and British anti-slavers as havens for freed slaves. In spite of the effort to end the slave trade, slavery continued to be practiced in the Americas. The British freed slaves in their Caribbean colonies in 1883. The French abolished slavery in their American colonies soon thereafter. Slavery was not abolished in the United States until 1864. Cuba and Brazil were the last countries in the Americas to abolish the practice of slavery in the late 19th century. The Atlantic Slave Trade had enormous negative effects on the continent of Africa. As was mentioned above in regards to the Kongo Kingdom, many parts of Africa suffered from an increase in violence, drain of people, and an economy increasingly reliant on slavery. Over four hundred years of slave trade had transformed the African Continent from coastal regions (where most of the trading with Europeans took place) all the way to the interior of Africa (where many slaves were captured to be sold.) Despite the tremendous consequences of the Atlantic Slave Trade on Africa, Africans still continued to make important progress during this time in areas such as literacy, metal working, and textile production. However, there is no doubt that the Atlantic Slave Trade changed the face of the earth in many ways and presented a huge challenge to Africa in trying to recover from this brutal period of her history. See Modules Six, Nine and Ten also for more discussion on consequences of the Atlantic Slave Trade. Without looking at the text above again, now test your geographical knowledge of the Atlantic Slave Trade in the pop quiz below. It may be that there are some questions that you can't remember the answers to, but do as much of the quiz as possible from memory. After you have completed as much as you can from memory, your teacher will give you permission to go back and look in the text for answers to the remaining questions. You should receive your own print out of the map so that you can write the answers directly on it. Draw and label arrows showing the flow of goods from Europe to Africa as well as the flow of slaves from Africa to various regions of the Americas. Show the routes that some of the Portuguese explorers took when seeking trade routes with Africa. Locate the Kongo (Congo) Kingdom on the map below.